Whisper of the Heart, the all too often forgotten Studio Ghibli that might just be one of their best to date. Unlike the majority of Studio Ghibli's work, Whisper of the Heart is not set in some fantastical realm. It does not even have any fantastical elements and while some might be disappointed by this, it actually results in one of the most involving and personal works from the studio to date. The film was directed by Yoshifumi Kondō and the screenplay was written by Hayao Miyazaki. It was said that Kondō was set to take the lead over at Studio Ghibli, but due to aneurysm, which could have been caused by excessive working, he died with Whisper of the Heart being his only Ghibli film, and it still remains one of the Studio's best in my mind. Plot: The following plot summary is copied from Wikipedia.com. Finding a cat riding a train, Shizuku follows it to discover an antique shop run by Shiro Nishi. In the shop is a cat statuette, "The Baron". After Shizuku returns home, she learns from Yuko that Sugimura has inadvertently upset her, as he does not know that Yuko likes him and instead has been having a crush on Shizuku herself. Sugimura's actions cause an argument with Shizuku, who eventually turns him down. Watch the movie to see what happens next. Plot: 9.3/10- Whisper of the Heart's plot is simple yet effective and deep in its own way. It is about a 14 year old girl named Shizuku, and it is basically a coming of age story. For those aspiring writers reading this, there will likely be a lot that you can relate to with the film, and while I am not a writer of fiction, as a writer of non-fiction, there was plenty for me to relate to as well. Also, while possibly slow at times, the pacing was perfect for what the film wanted to accomplish. Throughout the nearly two hour run time, never did I become bored or disinterested. Writing your first story: Something that a lot of people I know can probably relate to. With Ghibli movies in general, they often have some a few moments that seem overly and unnecessarily childish and corny, which really annoys me, but Whisper of the Heart never actually had that problem. Even though it was about kids, the movie is one of the Studio's more mature films because it never seemed like it tried to pander to a younger audience at any point. Despite having some minor problems with some of Ghibli's other work for not having enough conflict, Whisper of the Heart does not necessarily have a lot of conflict, yet it works because it has a well told and story with well developed characters. For those not familiar with Japanese culture, a few aspects of the plot might be difficult to grasp, but the English dub does help with that issue. Also, the route the movie takes never felt predictable. Characterization: 9.2/10- While not the most memorable character ever, Shizuku is a very well developed and realistic character. She has real problems, and many aspects of her story seemed as though it could actually happen. Seiji, while not given a lot of screen time, is good character for what is required of his character. The old shopkeeper, Shiro Nishi, is one of my favorite characters from the film because of his likable grandfather type personality. The movie does have some romance, and while romance between characters of this age typically annoys me, since it is animation, I did not have a problem with it. Sometimes the movie borders on sappy or corny, but the movie even pokes fun at that, so it was not a big problem for me. Acting: 9.0/10- While not perfect, the English dub is very strong and well done. Unlike a lot of other Ghibli dubs, the main actress was not age accurate, but it is not even noticeable during the film. Everyone takes their roles seriously and there is not a single overacted line in the film. The Japanese lead voice actress is closer in age to the character, and as usual, there is nothing negative to say about the Japanese audio. Basically, go with whichever you prefer. Art Style: 8.7/10- Even compared to some of Ghibli's previous films, Whisper of the Heart's animation is not quite the stunning spectacle that we have come to expect from the Studio. However, the lack in animation is not particularly a notable negative since the film only requires the simplistic style. Additionally, the background art for the film is still unquestionably fantastic. Soundtrack: 9.0/10- While not on the same level as Joe Hisaishi's work in other Ghibli films, Yuji Nomi's score perfectly suits the film. Being that the violin is my favorite instrument and that one of the characters is an aspiring violin craftsman, there is some really great music utilizing the violin. 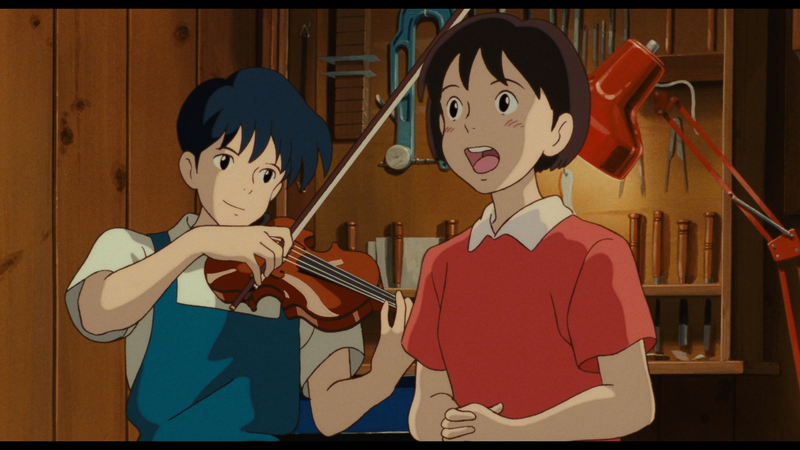 In the film, Shizuku writes an alternate translation of John Denver's song "Take Me Home, Country Roads," and the tune to that song is brilliantly used throughout the film in the score, as well as recited a couple of times in the film to great effect. In the English dub version, the characters sing an alternate version of the song, and in the Japanese dub, the characters sing the song in Japanese, both of which are well done renditions. While I am not the biggest fan of Denver's work, "Country Roads" is a song that I often heard ever since I was a kid because my family liked it, so being familiar with the song made me enjoy that aspect more. Humor: 6.9/10- The film is not a comedy by any means, but the film's few attempts at humor hit the mark nonetheless. Non-Otaku Appeal: Aside from Ghibli's standard animation style, there is nothing that should prevent non-fans of the genre from enjoying the film, because the movies does not contain anything weird or strange. 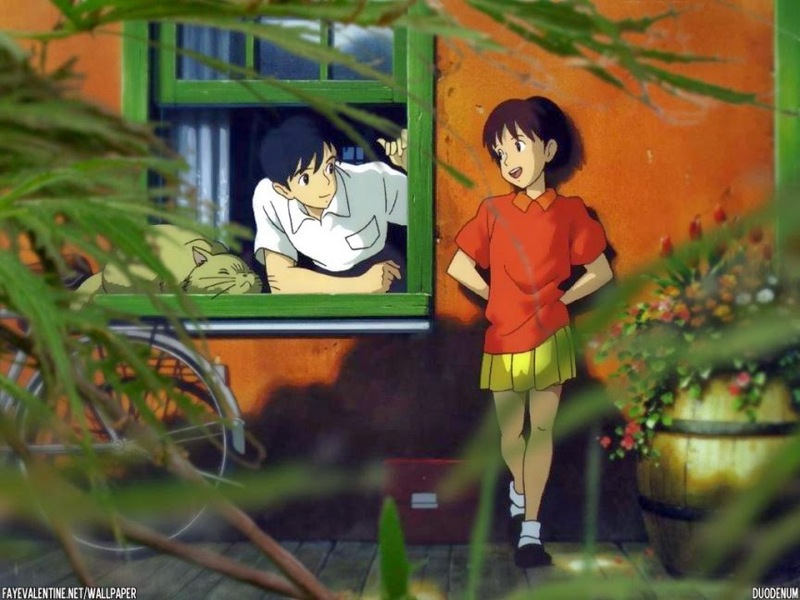 Overall: 8.7/10- Overall, Whisper of the Heart is an excellent film that hits every mark; there is virtually nothing negative to say about the film. While many viewers will not find the film nearly as enjoyable as I did, if you are a Ghibli fan, or an aspiring writer, you should at least give the movie a watch. Closing comments: Typically, this genre of film does not tend to appeal to me; Whisper of the Heart, however, is an exception. It works so well that I cannot help but give it praise. Yoshifumi Kondō's one and only Studio Ghibli before his death remains one of my favorite from the studio thanks to the effective story and likable characters. Please remember to check back tomorrow for my review of the anime classic, Clannad. Thanks Mariah Martinez for highly recommending this underrated gem, you can read her review of the film by clicking here. For yet another opinion of the film, you can read Ian's review over on Banon's Roar! by clicking here. Also, if you have reviewed this anime, leave a comment with a link to your review and I will post it here (providing it does not contain any explicit content). ﻿If you want to contact us or have any questions please send an e-mail to johnstarslayer@gmail.com.